Dorner is exhibiting its AquaPruf® Ultimate, AquaPruf® VBT and AquaGard sanitary conveyors in Booth No. 1014 at ProFood Tech 2017, April 4-6 in Chicago’s McCormick Place (Lakeside Center). Dorner manufactures custom conveyor solutions to meet numerous manufacturing and packaging applications within the food industry. Featured at Dorner’s ProFood Tech booth is the stainless steel AquaPruf® 7600 Ultimate Series, the only USDA approved pre-engineered modular conveyors on the market. Designed to reduce sanitation costs with maximum performance in wash down environments, AquaPruf’s open frame design features bearings mounted in cast stainless steel housings and no horizontal surfaces for optimum cleaning. Tool-less tip up tails and optional belt lifters give users 100 percent accessibility for fast and easy daily cleanings. 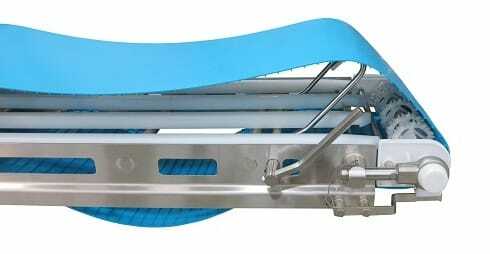 The AquaPruf 7600 Ultimate Series is available in both straight and Z-frame models with either flat or cleated belts. ProFood Tech attendees can also see the AquaPruf® Vertical Belt Technology (VBT) Conveyor, which moves bulk products in straight-up 90° sanitary applications and features a proprietary staggered sidewall belt that is easy to clean and designed for improved product release. It features an open frame design for quick cleaning, more effective product changeover, and less maintenance overall than traditional bucket elevators. Applications include elevation for walk-thru, hopper feeding, weigh scale feeding, general bulk handling and sanitary environments. To see how these and other sanitary conveyor platforms can help your food handling applications, make plans to visit Dorner in Booth No. 1014 at ProFood Tech 2017.